The church was built by the Crusaders. According to tradition, it is the site of the synagogue where Jesus first learned, prayed and later preached as a young man. 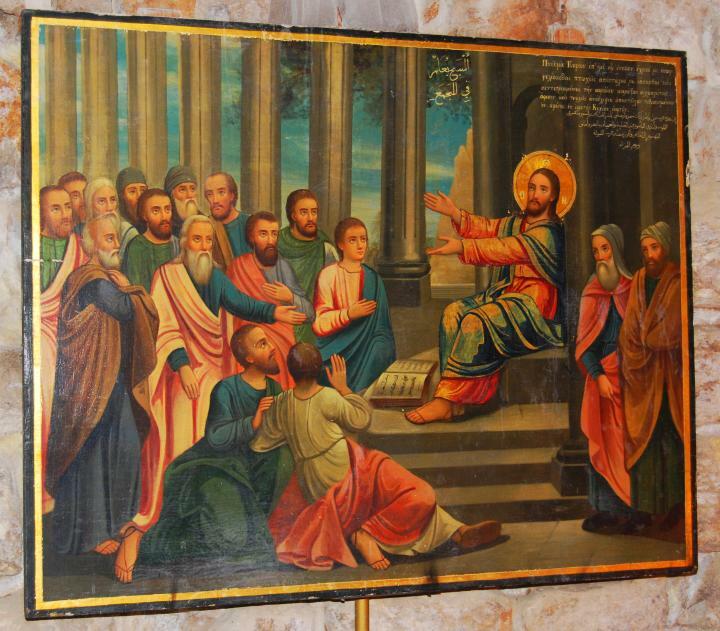 Luke 4 15-16: "And he taught in their synagogues, being glorified of all. And he came to Nazareth, where he had been brought up: and, as his custom was, he went into the synagogue on the Sabbath day, and stood up for to read". 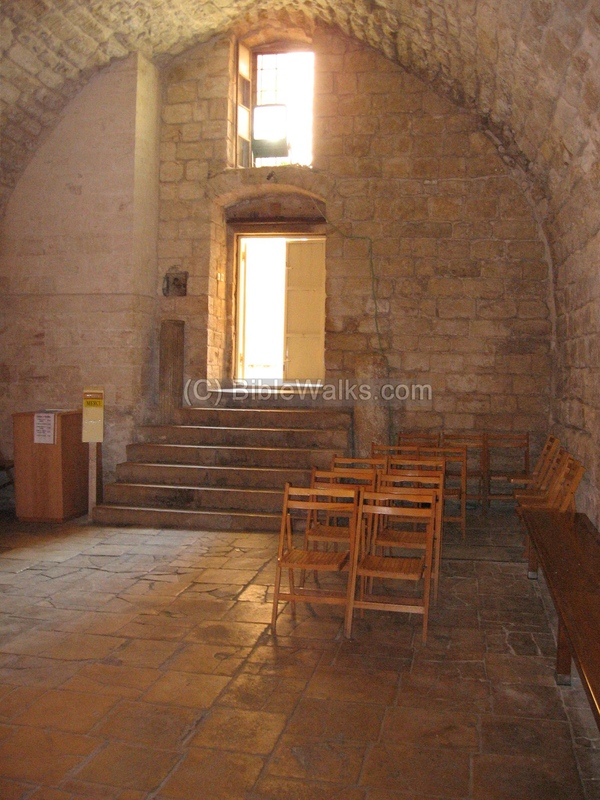 The Synagogue Church is a 12 C AD Church , built by the Crusaders. 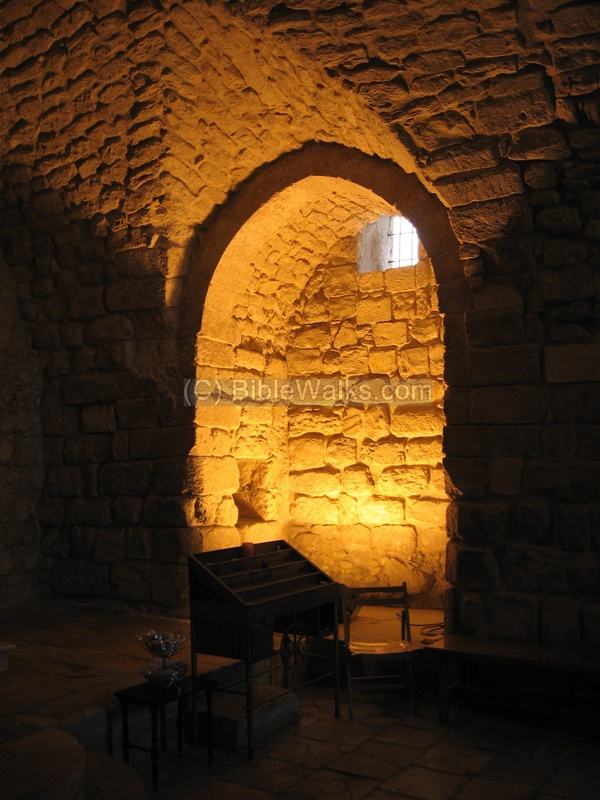 According to tradition, the church was built above the original location of the Roman period Synagogue where Jesus first learned, prayed and later preached as a young man. The Church is located in the middle of Nazareth old market (road #6120), in the Churches district, adjacent to the Greek Catholic church of the Annunciation. 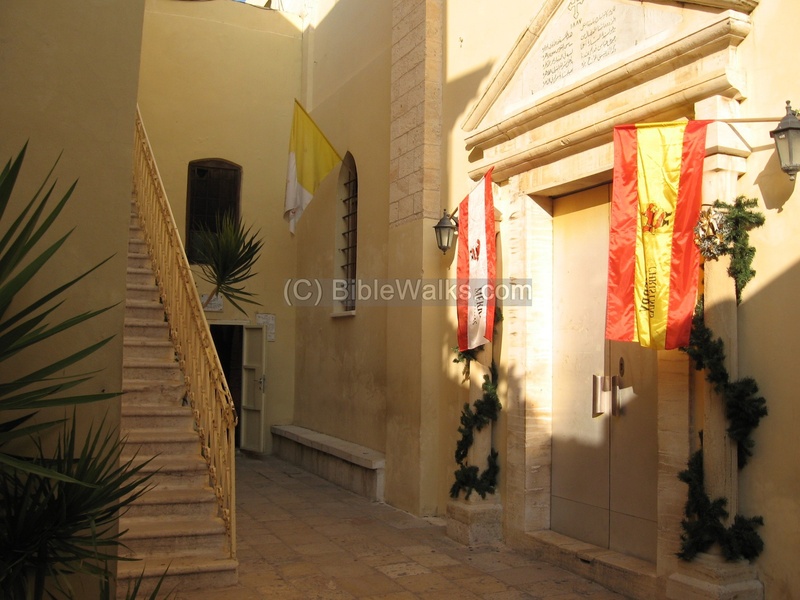 It is a few minutes walk from the Basilica of Annunciation through the steps of the market above the Basilica (road #6152). The church is a small and simple single hall structure, but the sense of history fills the room with holiness. 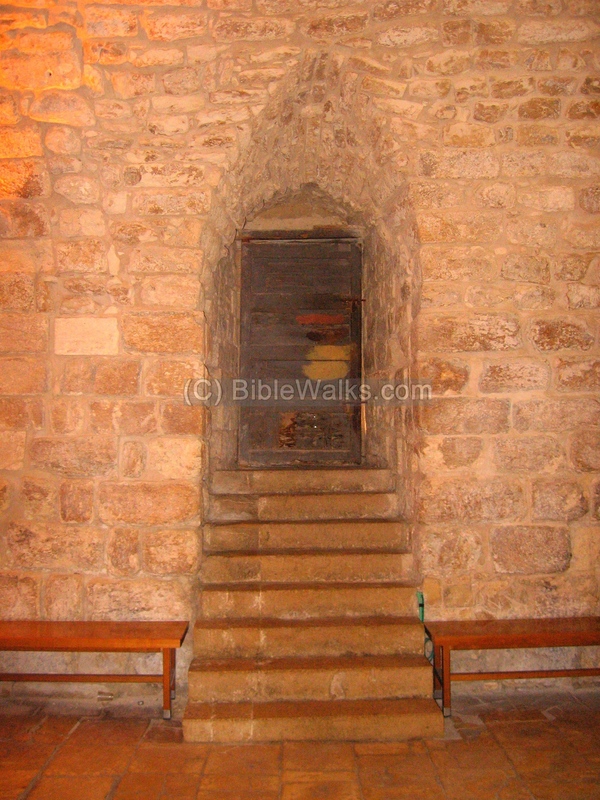 According to the tradition, the Jewish synagogue from the Roman period was located in this site, and this is where young Jesus visited. In 570AD an Italian visitor described the synagogue, and reported that the original Bible was still there, including the bench where Jesus used to sit. The Crusaders built a church over the site in the 12th C AD. 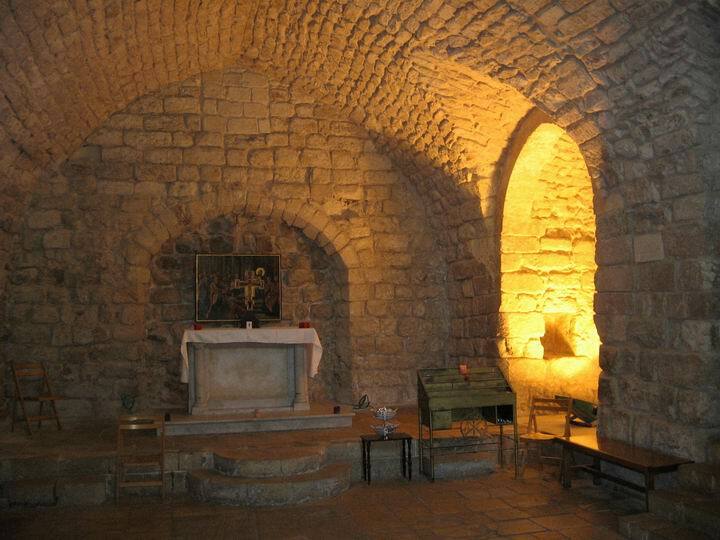 The church was under the control of the Franciscans until the 18th C, when the ruler Daher al-Omar passed it to the Greek Catholics. A view of the church in 1900 is seen here on the right. The Church is under the management of the Melkite Greek Catholics, and their modern church, added in 1887, is adjacent to the old structure. 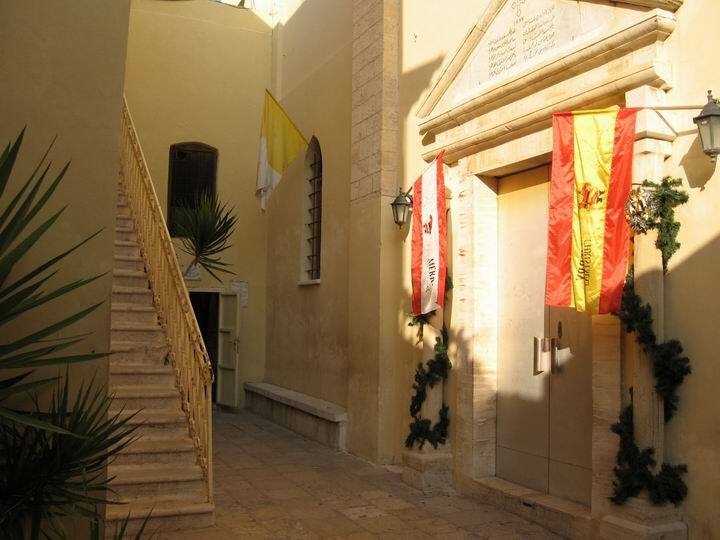 The following photo shows the entrance to both the Synagogue church (its door is on the left) and the Greek Catholic church (on the right). The synagogue church's entrance, as seen from the interior, is seen below. The Crusaders level is more than a meter lower than the modern church, and there are seven steps that lead down to its floor. In the entrance there are two ancient pillars, from an unknown period, embedded on the sides of the stairs that lead down into the room. 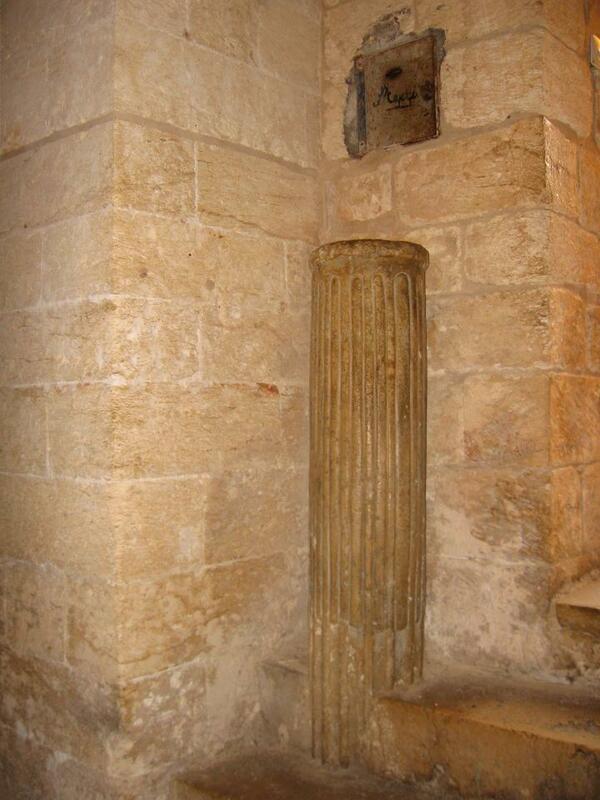 A closer detail of the left pillar is seen below. 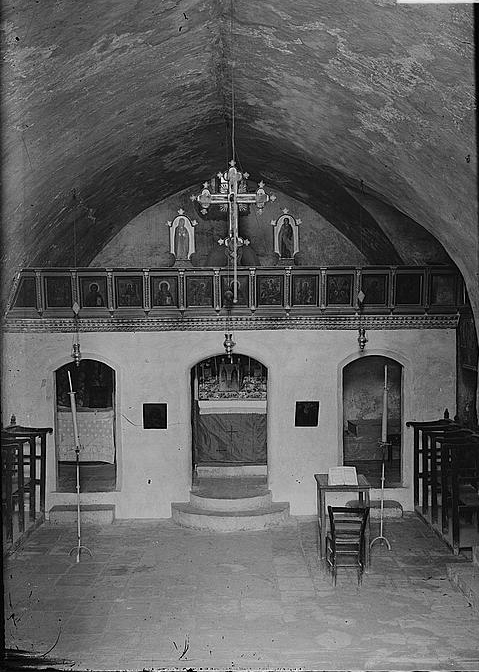 Inside the Church is a single hall. 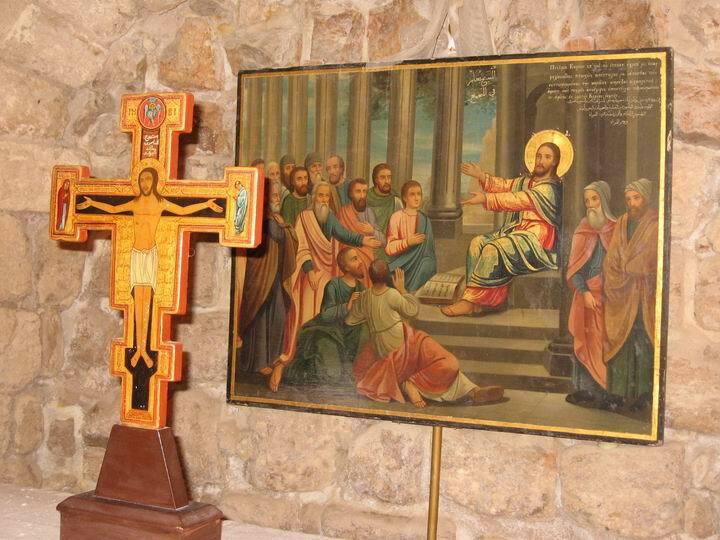 On a raised altar, the bishop faces the people behind the stone table. On the table is a single cross. Behind this table is a large picture with the scene of Jesus preaching in the synagogue. A detail of the cross and the picture illustrating the preaching in the Synagogue. A detail of the window on the right side is seen in the photo below. There is another niche closer to the entrance, which is a closed door that leads to the courtyard. Luke tells the story of the incident in the Synagogue, when Jesus read the book of Isaiah and his interpretation made the Jews so angry implying he is the Messiah, and they chased him out the city. "And he taught in their synagogues, being glorified of all. And he came to Nazareth, where he had been brought up: and, as his custom was, he went into the synagogue on the Sabbath day, and stood up for to read. And there was delivered unto him the book of the prophet Esaias. And when he had opened the book, he found the place where it was written, The Spirit of the Lord is upon me, because he hath anointed me to preach the gospel to the poor; he hath sent me to heal the brokenhearted, to preach deliverance to the captives, and recovering of sight to the blind, to set at liberty them that are bruised, To preach the acceptable year of the Lord. And he closed the book, and he gave it again to the minister, and sat down. And the eyes of all them that were in the synagogue were fastened on him. And he began to say unto them, This day is this scripture fulfilled in your ears. And all bare him witness, and wondered at the gracious words which proceeded out of his mouth. And they said, Is not this Joseph's son? And he said unto them, Ye will surely say unto me this proverb, Physician, heal thyself: whatsoever we have heard done in Capernaum, do also here in thy country. And he said, Verily I say unto you, No prophet is accepted in his own country. But I tell you of a truth, many widows were in Israel in the days of Elias, when the heaven was shut up three years and six months, when great famine was throughout all the land; But unto none of them was Elias sent, save unto Sarepta, a city of Sidon, unto a woman that was a widow. And many lepers were in Israel in the time of Eliseus the prophet; and none of them was cleansed, saving Naaman the Syrian. And all they in the synagogue, when they heard these things, were filled with wrath, And rose up, and thrust him out of the city, and led him unto the brow of the hill whereon their city was built, that they might cast him down headlong. But he passing through the midst of them went his way"
"And he went out from thence, and came into his own country; and his disciples follow him. And when the sabbath day was come, he began to teach in the synagogue: and many hearing him were astonished, saying, From whence hath this man these things? and what wisdom is this which is given unto him, that even such mighty works are wrought by his hands? Is not this the carpenter, the son of Mary, the brother of James, and Joses, and of Juda, and Simon? and are not his sisters here with us? And they were offended at him. But Jesus, said unto them, A prophet is not without honour, but in his own country, and among his own kin, and in his own house. And he could there do no mighty work, save that he laid his hands upon a few sick folk, and healed them. And he marvelled because of their unbelief. And he went round about the villages, teaching".